Tough, versatile, and comfortable with a total weight capacity of 400 pounds. It's equipped with a traditional 4-position incline bench with a comfortable, high-density seat and back pads. The standard bench has everything you need to develop all Major muscle groups in your chest, legs, arms, back and ABS. Include a preacher Curl pad, total leg developer; an 80-lb vinyl weight set with standard-size barbell and weight plates completes the package. Product assembled dimension is 61.5L x 60W x 46H inches. Shipping box dimension is 48.5L x 16.5W x 9.5H. 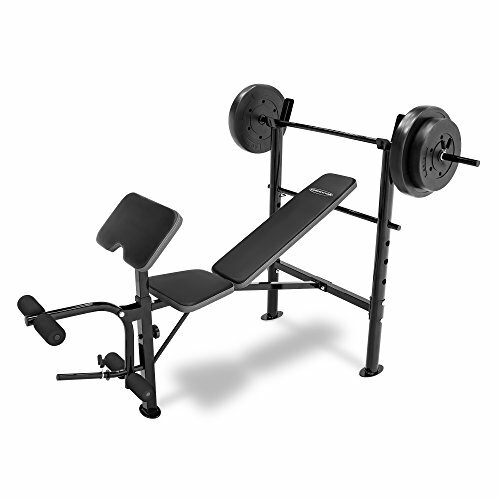 The total maximum weight capacity including user weight on bench is 400-lb. 2-Year limited manufacturer's warranty included. If you have any questions about this product by Competitor, contact us by completing and submitting the form below. If you are looking for a specif part number, please include it with your message.